Having settled our expenses in the hotel in Maribor, we were off to Venice, the departure port or our cruise, in no time. It took us a little more than 3 and a half hours to get there, following the lovely Slovenian highways and then the busy Italian ones. One thing to note about the Italian highways, is that these are toll-roads: there is no need to pay a general vignette, but you’ll have to get a ticket when entering them and pay when you get off. For us the toll-machine showed the price of €10.80 when getting off near Venice, so I think it is not as cheap as any of the other Highways. Upon arriving to the pre-booked parking (P5) at Marco Polo Airport, the barrier automatically opened up as it recognized the license plates (it would have opened up anyway because there were enough free spaces 😛 ) and a ticket was issued. We parked the car at a convenient place, memorized the location (:) ) and headed off with our luggage towards the arrivals terminal, where we could hop on to the ATVO bus bound to Piazzale Roma in Venice. From there we took the People Mover and we got under the MSC flags at the port in no time (some details about how to get there are in my previous post). 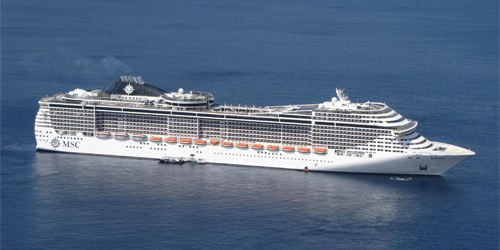 From there, checking in to the MSC Fantasia was not a quick process. Even though the company does everything to speed things up, the sheer number of passengers (~4000) takes time to get processed, so it is done in steps. Step 1 – show your boarding pass and drop off your suit-cases: You have to stand at the end of one of the long-long queues and patiently wait until you get up front to show the ticket, get a bunch of welcome papers, and directions about where to leave your luggage and where to continue to proceed with checking in. Step 2 – MSC Cards: Take the usual (as I was later informed) “on-boarding picture” and carry on to receive your MSC Card, get our ID-picture taken so that they do not loose you anymore ( 😛 ) and get a bunch of more papers about your cruise. After this you also get a bonus walk-through of all the discounts you can get if you buy one of the drinks packages you actually don’t need… no thanks 🙂 . Step 3 – security: Almost as checking in to an airplane, you have to walk through a metal detector (somewhat lighter version) and then you may proceed to the ship. After waking up from the initial shock of encountering the ship, the next challenge is to find your room. Everything is well labeled, but still it is a labyrinth. We had a windowless, interior room, on the 12th floor, because we figured we would not stay too much in the cabin during the day (and boy we were right… ). The initial encounter was not bad: everything was well prepared (apart from the Russian (!) language welcome paper, which was cordially switched after we notified it) and very tastefully decorated. Entering the room was possible with our MSC Cards (which we later found that had even more powers 😀 ). There was one more important thing to do at the reception: giving our MSC Cards some more power. This was achievable by going to the reception and ask the man at the desk to fill it up with the amount we payed by cash (minimum of €250 ). After this was done, we had all the power to freely move around and access (almost) all facilities of the ship. Next stop, was the Zanzibar bar on the 14th floor, where we could take a plate and just fill it up with any kind of food. The selection was huge. And because we were hungry, the pile on the plates got huge, too. It was a nice first meal 😉 . This was the first time we had to use one of our MSC Cards for payment, too: every type of food is free at the buffet, but you have to pay for the beverages (apart from water and the liquid called coffee coming from the machine). The price for a coke (0.33l) was €2.5 plus 15% service charge. By the time the houses of Venice got small enough to be boring, we went back to our cabin, and to our delight, we have found our suitcases already delivered there. This was wonderful news: we could at last get a shower and prepare for the evening show at the theater. We were 2nd seating diners, this meant that the show for us started at 19:45. It was OK, I was not that hungry, yet, anyway… The first show was very interesting: full of acrobatic moves, singing and dancing. It was a lovely 45 minutes, where we first encountered the animator team of the ship also. The next big event of the day, was the dinner (from 21:00). Dinner on the ship for us meant gourmet-style dining, complete with white dress waiters and words you cannot even pronounce from your menu. All the food was included in the ticket price, so we just had to choose what to eat and eat it. Again, drinking was not free of charge even in the restaurant (which was called “Il Cerchio d’Oro”). Again, we had to use our MSC Cards for water and wine that we wanted to consume during our dinner. The prices were OK: a quite tasty glass of wine was for instance €5.50, plus 15% service charge. On a Saturday morning we woke up (quite early) and headed off to the first “checkpoint” of our long trip. Our route took us through Hungary and into Slovenia. After enough walking around on the river banks, we decided to grab something to eat. We sat down at the most populated restaurant (Grill Ranca) which served local dishes and tried to figure out the what the names of the dishes meant. Luckily the waitress spoke a little English and with her help we found out, that most of the dishes contain minced meat (it was basically the same grilled, minced meat served in different ways). Anyway, I think the food is OK, even for such a limited variety. It basically resembles a well made burger (without the buns) and if you like burgers, then this is worth a try. After somewhat filling our bellies, we had a nice walk back to the hotel and prepared for the next day, which was the most promising of all: the first contact with the cruise-ship. While living in Genova, every Sunday (well, almost every… 🙂 ), I used to go out to the port to admire a huge cruise-ship (the largest in the Mediterranean at the time) as it left port at around 6 PM. I always went with a camera (which has very good zoom) and tried to make close-up photos of what life could be like on the ship. Well… I could not get much out from outside I must admit… Anyway, I decided, that when I had the chance, I would book a trip on it, to find out directly what life could be like on such a ship. Time has passed since then (around 5 years): the cruise-ship, MSC Fantasia, is not the biggest in the Mediterranean anymore and it follows a different circuit then back then but my will to get on it never faded 🙂 . Sooo… having quite the adequate occasion (got married 😀 ), I decided to book a 7-day trip on the ship and enjoy our Honeymoon on a cruise. To book a voyage on such a ship, I had to apply for the help of a tourism-agency, so that part was taken care of quite easily. We chose a 7-day trip in the Eastern-Mediterranean in the end of September starting from and returning to Venice. I did not ask, however, for anything else from the agency. I wanted to arrange everything else myself (as I usually do 🙂 ). The second option is of course: by car. This was not such a relaxing option, but if I counted with a 2 day trip (one way) with staying at a hotel somewhere in the middle, it did not seem to be such a bad idea… It also had the added value of no limits with our luggage… So the decision has been made: get to Venice in a 2 day trip by car and get back again following the same route. The plan was ready. But what about the details? Well, one important detail was: what to do with the car once we get there? After some Google-ing around, I found the long term parking at Venice Airport to offer the best prices. You can book ahead (I used the license plate recognition system) and get a discounted price. Getting from there to the ship terminal was the same as if you had arrived by plane: jump up to the ATVO line which leaves every 30 minutes and in about 20 minutes it gets you to Piazzale Roma. The ticket costs €6.00 (one way, because a two way ticket is only valid for 7 days). From Piazzale Roma, you can get a ticket on the fancy People Mover (€1.30 one way trip) and get to the ship terminal). Actually there is a detailed guide about how to get there on this website. The next important detail was: what places to choose as stopping points on the two way trips? Well on the “to”-trip we needed a place close enough to Venice, but not too far from Cluj. For this I chose a location I already knew: the Slovenian town of Maribor. In Maribor I chose also a hotel that I knew very well: hotel Orel, which is basically in the city center, offers free parking and has a decent price. On the return trip the location was Budapest, just cuz we were familiar with it, too. So there you have it. The plan ready made, we just had to try and follow the checkpoints in a journey which took us 10 days and I will write about it in the following posts. This year’s skiing destination was chosen to be in Slovenia, in the vicinity of Maribor: the 2nd largest city in Slovenia. The city is situated on the Drava river at the bottom of the mountain Pohorje. 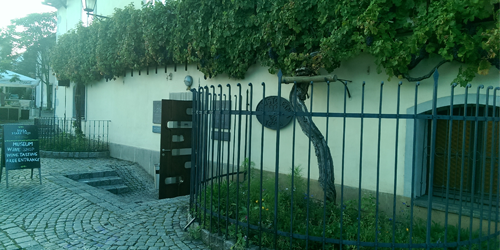 Unfortunately I did not have much time to explore Maribor itself, but the hotel itself (Hotel Orel), where we stayed, was right in the heart of the city. The small part I’ve seen gave the impression of a quite nice and clean city. It is important to note, that Maribor is planned to be the European Capital of Culture in 2012. So, the slopes. The slopes on Pohorje are OK. The only bad thing is the fact that last year I’ve been to one of the biggest resorts in Europe (Les 2 Alpes, France) so the point of reference was quite high. Of course it is by far not as big as last year’s complex on the very top of the Alps, but I think it is a quite neat place. The difficulty of the slopes varies from easy blue trails to steep black ones. Personally I enjoyed the winding blue slopes mixed with a few wide, red shortcuts. Although it was the middle of the week the slopes were quite crowded, with children learning to ski, but also with pro-skiers thundering down with high speed. There is a quite modern system of cable-cars and open-chairs which one can use to go back up the top after a fun-ride down. I have no idea about the prices, because for us it was included in the holiday-package we just asked for it at the ticket-shop, presenting the papers they gave us at the hotel. The entire atmosphere reminded me very much of Austrian/German atmospheres: beer, huge quantities of food and the music. The music was the exact sound as the German counterparts, just that they were all in Slovenian. I guess neighboring countries borrow a lot from each-other. And speaking of neighboring countries: Slovenia is also neighbor with Italy. Italy is famous for their pizzas. That was borrowed also: I do not know if it was the fact that I was hungry or not, but the pizza I ate in a restaurant at the bottom of the slopes was really-really good. The Pohorje slopes also allow evening-skiing. The front part of the slope-system can be entirely lit in the evening. So after the break between (4PM to 6PM), when the slopes were closed, the second part of the skiing-day started and the slopes were lit to allow skiing in the evening. I did not try it because I was always too tired of the morning rides, but it was quite an interesting sight from the city to see the slopes lit on the neighboring mountain. Because I am a fairly newbie skier, this year I have only bought ski-boots, because I was told they were more important that the skis themselves. The skis: I have rented them at the bottom of the slopes. They charged me €61.2 for a pair of skis and poles for 4 days. The good thing about renting was that I could leave the equipment at the renting office every day, so I did not have to drag them with me every day. Which is a good thing, because we were four and I could only fit 3 pairs of skis+poles in my car (although I have a quite neat inner ski carrying system in the car, about which I could tell entire stories, but this is not the time). The holiday package also included free pass into the local wellness center: a good place to relax after a day of skiing. We used it every day. They have a lot of things from different types of jacuzzi, to sauna. They also had an outside swimming pool with hot water in it. It was interesting to swim in hot water while it was snowing 🙂 . I must also not forget the community which invited me to this great holiday: the Élő Erdély Egyesület (“Living Transylvania Association”). I am not a member, but I know some people from it, so they were kind enough to invite me also, so I think I have to say: Many Thanks 🙂 , I enjoyed the holiday. I almost forgot: here’s a link to my Picasa gallery about the holiday. Enjoy 🙂 . First I have to say I am sorry for the long time span during which my blog has been in the same state. Think this is what happens when someone goes on vacation for a week before another busy week at work. So… where was I? Well, I went skiing. And this post is going to tell the first part of my experiences (Yuppieeee, back to posts about traveling 🙂 ). 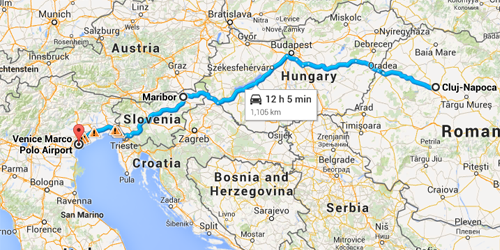 In this post I would like to talk about the road to our destination: Maribor, Slovenia. 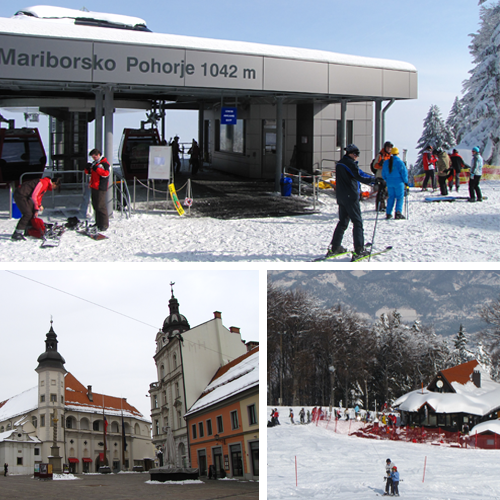 About Maribor and the ski-slopes I will tell in the next part of this double article. That story requires a bit more writing and my fingers right now are not suitable for that great task… In this article I am going to talk about something much more important than the skiing itself: how to get there? (After all, there is no skiing if you can’t get to the slopes). This meant a simple drive from our sluggish roads until I got to the Hungarian highways. From there on it was a piece of cake. I must say the Hungarian highway system is quite good (so far I have tried driving on M1, M3, M35, M7 and M70). The roads are new, consequently still good and the traffic was always acceptable. What I didn’t like was the fact that Budapest’s highway-ring was… well, practically unusable: M0 has such a big radius, that it is better to use one of the inner circles and drive through the city. I also noticed the annoying fact, that after entering from Slovenia (M70->M7) if you do not buy a vignette in Slovenia, you have to drive for a couple of kilometers until you find a place to buy a vignette (basically driving illegally in that period). Hungary: Vignette for 4 days: is 1170HUF (€4.5 or 18RON). Despite this fact, I have payed cash at the entry in Hungary from Romania and they told me I can use RON, too. I was not paying attention to the conversion and they charged me 30RON for the vignette (nice busyness…). A small fine (like forgetting to turn the lamps on, after re-fueling and driving like that for a few kilometers): 10000HUF (~€35 – if you can explain yourself to the policeman). The gas price was around €1.14 (at a Shell pump). In Slovenia I payed for the Vignette for 7 days €15. I did not have to re-fuel so I have no idea on fuel prices, but I am guessing a little over the Hungarian prices.